What Are the Benefits of Pure Ginger for the Digestive Tract? Ginger is a root or rhizome that grows underground and commonly is used as a seasoning. You can consume ginger fresh, candied, dried or pickled. 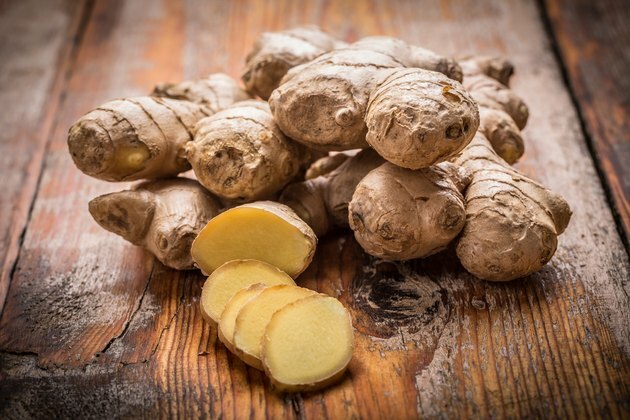 Ginger also is ingested to treat a number of medical conditions, including cholera, hemorrhages, toothaches, nausea, diarrhea and stomachaches. According to the University of Maryland Medical Center, ginger has been used to enhance digestion and treat stomach upset and nausea for over 2,000 years. Ginger aids the digestive tract by toning muscles in the intestine and stimulating the breakdown of food particles, according to the University of Texas Medical Branch at Galveston. This activity promotes motility in the gastrointestinal tract and assists in transporting food and other substances out of the intestines. Thus, ginger can help soothe your gas pains, digest and metabolize fats and relieve common stomach pains. One gram of ginger consumed for a maximum of four days may relieve symptoms of pregnancy-related nausea. According to the University of Maryland Medical Center, ginger performs significantly better than a placebo for alleviating morning sickness. Ginger also may help decrease symptoms of nausea from chemotherapy and anesthesia. However, more research is needed to confirm these benefits. Prepare pure ginger to assist in digestive problems by peeling the ginger and grating it into your salad or main meal, according to Georgia Southern University. If you experience motion sickness, cut off a piece of ginger root and eat small bites throughout your travel. Additionally, you can make tea using pure ginger. Chop fine pieces of ginger and place them in boiling water. Allow the ginger and water to steep and drink the tea. Ginger is a relatively safe food to ingest. However, eating ginger does pose some risks. Avoid ginger consumption if you experience gallbladder stones, as ginger increases the flow of bile. Limit your consumption of ginger if you are pregnant or have a bleeding disorder, as ginger inhibits your blood platelet aggregation. Additionally, limit your ginger intake and consult with your physician if you take central nervous system depressants or anticoagulant medications.